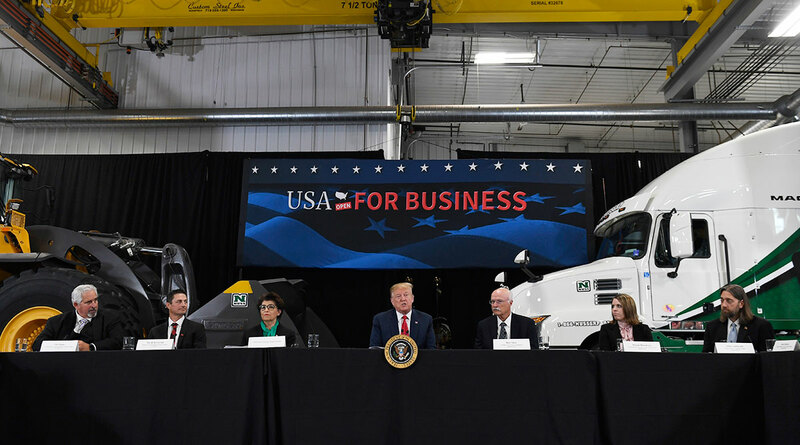 While visiting a truck dealership in Burnsville, Minn., President Donald Trump touted tax cuts passed by Republicans in 2017, even as the law has swelled the deficit and failed to gain traction with voters in last year’s midterm elections. Look back at trucking's 2017 visit to the White House: Story, video and photo gallery. The visit to Minnesota — a potential swing state in the 2020 election — is part of a week of events designed to promote the tax law’s effects on the economy as he turns to his re-election campaign. As Americans finish filing to the IRS for the first time under the new system, Trump is trying to turn public opinion over the cuts to his advantage. Trump was joined at a roundtable setup in the dealership construction shop. He was welcomed by Bob Nuss, the president of the trucking dealership that sells Mack trucks and Volvo construction equipment. "What better setting than to have a Volvo loader and a Mack truck," Nuss said. "These two represent everything that builds America and moves America." "I love them, I love them," Trump responded. "I've been on many a loader. I've been on many a truck." The U.S. budget shortfall grew by 17% to $779 billion in fiscal year 2018, which the Congressional Budget Office has said was partly a consequence of the tax law. Along with additional spending that’s been signed into law, the CBO projects the deficit will surpass $1 trillion by 2020. The nonpartisan Tax Policy Center seaid that two out of three taxpayers would see their taxes go down. The biggest benefits, though, go to the top 1%, who are projected to receive an average tax break of $62,000 in 2018, while the middle one-fifth of income earners got an average tax cut of $1,090 — about $20 per week. But an NBC/Wall Street Journal poll this month showed that just 17% of Americans believe their taxes have been cut. A Reuters/Ipsos poll in March found that 21% thought their taxes were lowered. The tax cuts didn’t provide Republicans the boost they had hoped for in the November midterm elections when the Democrats took control of the House. The tax law, passed by Republicans over Democrats’ objections, lowered the corporate rate from 35% to 21% and cut individual taxes across income brackets for eight years. It doubled the standard deduction and enhanced the child tax credit. And it closed or tightened various tax breaks — most notably by capping the amount of state and local taxes that can be deducted — which had its biggest impact on residents of high-tax, largely Democratic-run states. There’s “no question” that the advantages for businesses from the tax plan have just begun to kick in, Treasury Secretary Steven Mnuchin told Fox Business on April 15. He said those benefits will become more apparent over the next few years.